I’ve mentioned before that certain members of any trio can be generally classified as either the Kirk, the Spock, or the McCoy. In my previous review, I classified Alex Lifeson as The McCoy of Rush, since he’s the most wild and passionate of the three. In this respect, I would personally classify Geddy Lee as The Spock. I don’t say this because Geddy isn’t emotional (his singing at least is), but because he is perhaps the most logical member of Rush. In almost any Geddy Lee interview I’ve watched or heard, he comes off as the most calm member of the band and I don’t think I’ve ever seen him get angry or raise his voice. While Alex’s gear and playing style is constantly changing and evolving between tours and albums, Geddy’s backline was relatively the same from the band’s formation until 1991, and it’s rarely been more than a bass and an amp. In concert or on record, if he’s not playing a dry bass guitar he’s playing a dry acoustic guitar. With the former though, he stands as one of the most dexterous and distinct bass guitarists of all time, and has been cited as an influence by countless professional bassists. Even just by a cursory glance you can tell Geddy is an intensely disciplined musician. In concert he carries a huge load, having to cover lead vocals, bass guitar, keyboards, synth pedals, the odd acoustic or rhythm guitar, and sampling, often all within the same song. Also, while Alex’s sense of humor is usually classified as absurdist, Geddy’s is more wry and deadpan, saying silly things with a straight face a la “Airplane!”. Perhaps this is how Geddy and Alex have been friends for so many decades: because they compliment each other so well. Where Alex is all over the place, Geddy is more deliberate. Geddy is the kind of man who uses two words to describe something when others would use six. With “Victor”, Alex pulled in everyone and anyone who wanted to participate, from famous musicians to family members. 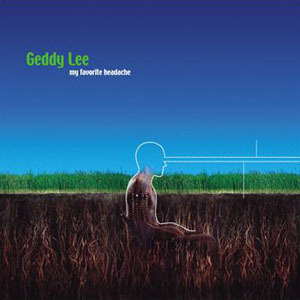 For Geddy’s solo album, “My Favourite Headache”, he performed and recorded most of it with two people: Ben Mink, who produced and co-wrote the album while providing guitar, and Matt Cameron (of Soundgarden and Pearl Jam fame) who provided the drums. Only one other musician is credited on the album (Jeremy Taggart), and only for one instrument (drums) on one song (“Home On The Strange”). With such a tight cadre of musicians, it’s no surprise that “My Favourite Headache” has such a tight focus. Where “Victor” was at different points industrial, metal, instrumental, dark, poetic, and silly, “My Favourite Headache” is mostly straight forward hard rock. It is perhaps what a new Rush record would have sounded like if the band had written and released one around this time. I should confess though I went into reviewing this record with a little bit of dread. While I think Geddy is a great singer, musician, and songwriter, he’s not my favorite lyricist. Granted he’s up against an unfair standard working opposite Neil Peart, one of the greatest rock lyricists alive. But Rush songs with lyrics written by Geddy have run the gamut from adequate (“Cinderella Man”) to awful (“In The Mood”). So when I started listening and writing my notes, I wasn’t sure what I would get here. Literally the first thing you hear on the first song (the title track) is Geddy’s bass thundering in before Mink’s squealing riffs roar to life, switching gears to haunting synth pianos and strings during the choruses. The verses are really strong, but lyrics like “I don’t mean to be so nihilistic” are a bit on the nose for me. Still, I can’t help but wondering if the lyrics for this song were referencing Neil Peart, who was literally running from his grief and unable to bring himself to believe in anything during this period. Still, lyrics like “I watch the sea/I saw it on TV” are a bit simplistic for me. “The Present Tense” opens with a bright single-coil grind before moving to jangling acoustics on the verses. The lyrics latch onto the song’s title and don’t let go. I’m finding it hard to not endlessly compare Geddy’s lyrics to Neil’s, but here I have to. Neil throws out philosophy, statement of purpose, and freeform prose to state and sing something exhilarating and profound. Geddy meanwhile seems to go more for whatever rhymes, and thus the words seem loosely connected at best. “Window To The World” has interesting use of fuzz and tremolo on the guitar, and good sitar emulation warbling in from the periphery. It’s perhaps the most wild and esoteric so far, but again the lyrics fail, with the song being almost all chorus. The song’s abrupt ending is a disappointment too, as it seems to land before truly taking off. Lyrics for “Working At Perfekt” are a bit better, having more of the deep meaning I enjoy so much from standard Rush songs. “Success to failure/Just a matter of degrees” is something I’ve found to be true. Rush has always taken getting rejected by mainstream publications or the Rock and Roll Hall of Fame in stride, instead judging success by their own standards (as they should). The string arrangements and piano on this track are a highlight as well, making things very lush. “Runaway Train” has a more bluesy tone, with stuttering echos as a garnish, and an acoustic breakdown in the bridge. I’m noticing an unfortunate trend with these lyrics: Geddy will latch onto a certain phrase in a song and beat it into the ground. For “Runaway Train”, it’s thankfully not the title, but instead the phrase “You’ve got to want it”. I’m having a similar problem here that I did with “Test For Echo”. I stand by my belief that Geddy Lee is a great singer, and uses his voice as an instrument in itself to provide melody on top of the riffs. He’s only as good as the lyrics he has though, and when he has simple ones like these it does his skills a disservice. “The Angels’ Share” is mostly acoustic guitar and strings, the closest Geddy himself has gotten to singer/songwriter territory. Lyrics still aren’t great, but it still has Rush’s great humanist spiritualism. You get the feeling this is the track for Geddy that comes most from the heart. I kind of like this more than the hard rock stuff I’ve heard so far. I get the general premise of “Moving To Bohemia”: guy is sick of living in the suburbs, and wants to move to somewhere more romantic with his wife. During the chorus though, it gets baffling with lines like “I had a dream of a different place/I had a dream you had a different face”. Am I wrong with my assumption and the singer is actually dissatisfied with his marriage? I dunno, it’s weird, and not exactly in a good way. Strings during the bridge are good though (Ben Mink really brought his A-game with the string arrangements on this record). “Home On The Strange” is easily the wildest track so far, with its funky tone and wha-wha guitar. This is more veering towards weird in a good way. Lyrics are still simplistic, but how can I not like a song about a Canadian who “sleeps with a chainsaw” and “sleeps with his clothes on” (why do I suspect this is his tribute to Alex?). It’s feels like Geddy is taking the piss now, with lyrics like “He sings fa fa fa fa fa”. I still dig it though, and would probably call it the most unique song on the record. “Slipping” is in singer/songwriter territory again, with more acoustic guitar but trading in the strings for piano. The lyrics still aren’t great, but the vocal melodies are spectacular and Geddy makes them work regardless. If he had managed more miracles like this, I’d probably be rating this album higher right now. “Still” has more acoustic guitar and gorgeous sounding reverse delays, with a smattering of keyboards. This has a strong vocal melody and good lyrics, and you can tell this one really comes from the heart for Geddy, talking about perseverance and getting “Halfway up the hill/My fingers may bleed but I’ve got to get there”. Maybe it’s about him and his bandmates getting through a hard time (which they were)? Who knows. The album closes with “Grace To Grace”, and gets back to the hard rock, with dreamy, spacey Hammond organ diversions during the chorus. Strong riffs, strong vocals, and the lyrics are pretty good. Of the hard rock songs on this record, this is probably my favorite. Let me be absolutely clear: I love Geddy Lee. I’ve been hard on him as a lyricist during these reviews, but everything else? I have nothing but respect for him. The first half of this record, I was dreading it because I was having too many flashbacks to “Test For Echo”. That record still had Neil on board (the easily superior lyricist) and it still wasn’t very good, so what chance does this have?! Geddy surprised me though during the second half of “My Favourite Headache” with the more plaintive acoustic work, to the point where I wish I had heard more of that than the hard rock. It showed a side of Rush’s logic center I hadn’t seen much of, and I just wish it could be elaborated on more.